The Porta Brace TS-41B Tripod Shellpack Case (Blue) is a 1000 denier Cordura padded case with an armored interior shell. This is a very rugged case, which can be used for everyday field work, but will also withstand the rigors of extensive travel and shipping. It has a quick-release wooden handle with a padded grip that makes for very comfortable hand carrying, and backpacking shoulder straps for hands-free carrying. 1000 denier Cordura, padded case made to carry a tripod with head and accessories. 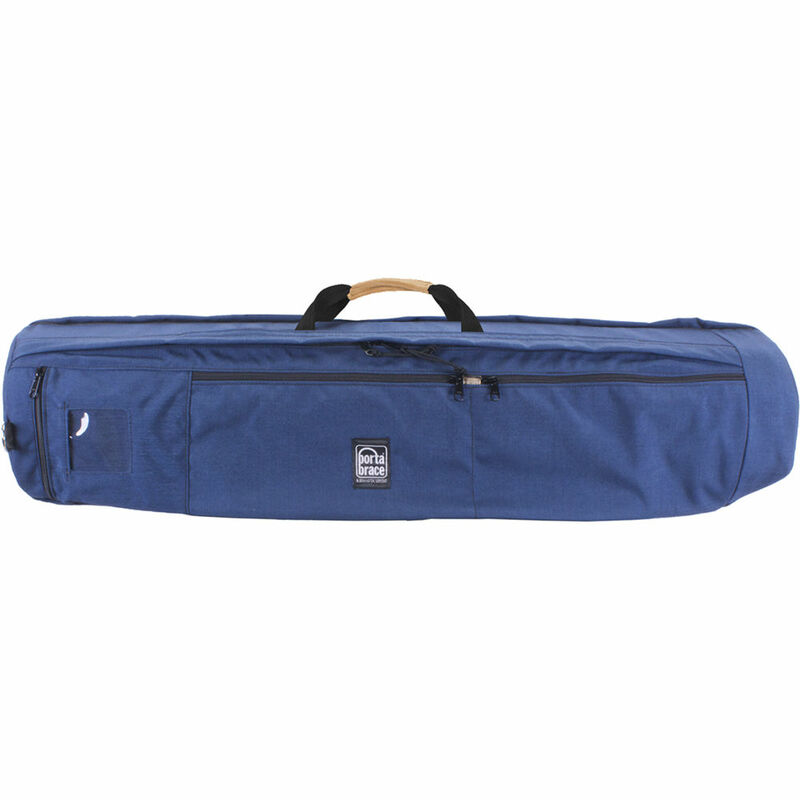 Four long hanging pockets (2 on each side of the case) hold padded blocks for shipping protection, or can be used to hold tripod plate and excess gear such as handles, fishpoles and microphones. Hard rubber foot pad for tripods with spiked feet. Two sets of red touch fastener straps for cinching tripod heads and legs. Tripod and head up to 41" in length with folded legs diameter less than 12"
Box Dimensions (LxWxH) 41.0 x 18.0 x 14.0"
TS-41B Tripod Shell Case (Blue) is rated 5.0 out of 5 by 2. Rated 5 out of 5 by Anonymous from Great case I use the case to travel internationally with a tripod and cineslider. The product offers great protection and allows for more room than just a tripod which helps keep the cost down on traveling. Rated 5 out of 5 by John R. from A Monsterui Bought this to take a tripod, monopod and slider for travel - somwhere to put expensive gear and entrust it to airlines. It works. It's not as spacious inside as I'd imagined... Can't put as many clothes in there as I'd hoped. With Miller Solo, small Manfrotto fluid head, monopod, and a 2-ft travel slider, I can get a good hefty sweater, a shell anorak, long johns and heavy gore tex pants. There are inner pockets that I use for quick release plate, small ball head, and some small tools. The nice surprise is the outer pockets, which a land a little and take t-shirts, socks and the like. There are some smaller outer pockets that can organize some flattish items, but I don't use them much. The case zips up beautifully, and the padding and armor really give me confidence that my gear will be in good shape when it comes out on the belt. Finally the case has backpack straps, so the whole thing can go on your back with relative comfort for the schlep to the rental car. The case is sized just right to avoid oversized baggage fees. Meets or exceeds all of my expectations, in true Porta Brace fashion.